About a month ago, I developed an odd little liking for the sharing economy. 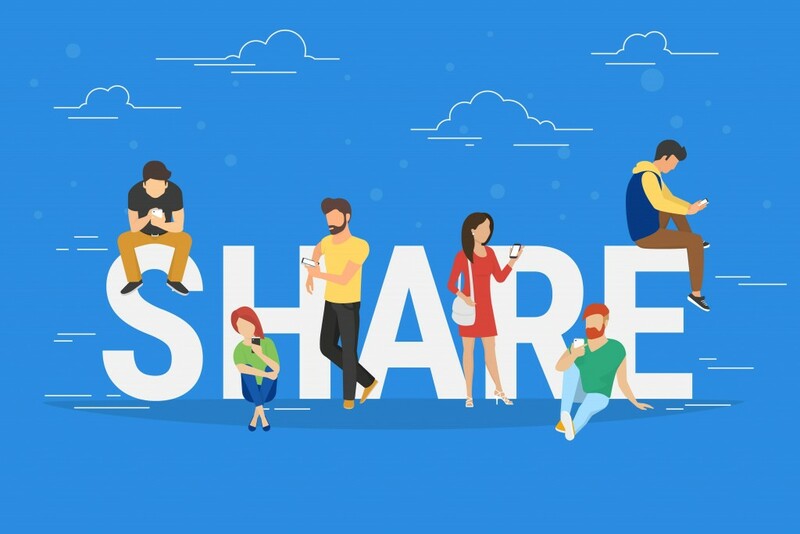 But, when I first started with some basic research, I was under the assumption that the sharing economy was a new and novel concept built in the minds of creative geniuses like the founders of Airbnb, Lyft and TaskRabbit. Sure these people are creative geniuses. But the sharing economy is far from new. It’s derived from things like the barter system, renting, lending and swapping. It has merely been cemented into the new age through the influences of tech and social media. But it has changed the way that we interact with the world. Back in the early 2000s, saying that you were gonna spend a week in a strangers home would have sounded insane. In fact, at the end of 2014 there were 13,098 listings in London on Airbnb. Today that figure is around 77,000. That’s an increase of almost 600 per cent. And in the past, hotels weren’t just a symbol of money or status. It was verified and trustworthy — built on culture and tradition. It was something you could rely on. But now, we are willing to place our comfort in the hands of a stranger. We’re willing to meet people we interact with on a 5-inch screen. We’re willing to cast aside our primal fears and embrace the unknown. Think about the kind of cultural shift that we’re looking at here. Maybe it should really be called the trust economy. And it blows my mind. How did we get here? How can we, as designers, build for trust? After all, Airbnb one of the largest dealers of trust was founded by two designers. So what can we learn from them? To really understand this, let’s try to break down the different interactions that people have — the first impression, learning more and finally building a relationship. The biggest reason that people don’t trust each other is because they are overwhelmed by how new and different everything is. People have an affinity towards what they already know. They try to stick to their comfort zone. Which is why we tend to favour people who seem more like us. In fact, there’s a word for it — in group favouritism. But what use is a bias like that in a world that is as diverse and varied as ours? Now, here’s a discovery we made just last week. We did a joint study with Stanford, where we looked at people’s willingness to trust someone based on how similar they are in age, location and geography. The research showed, not surprisingly, we prefer people who are like us. The more different somebody is, the less we trust them. Now, that’s a natural social bias. But what’s interesting is what happens when you add reputation into the mix, in this case, with reviews. Now, if you’ve got less than three reviews, nothing changes. But if you’ve got more than 10, everything changes. High reputation beats high similarity. The right design can actually help us overcome one of our most deeply rooted biases. Reviews are an excellent form of social proof. According to a research done by Nielsen, 92% of people will trust a recommendation from a peer, and 70% of people will trust a recommendation from someone they don’t even know. Because high reputation beats high similarity. It gives users all the validation they need to trust someone or something. But you know this already. What people often forget is that it’s important to encourage users to leave reviews. People tend to underestimate the value of their own words. They need to be reminded that they are heard. A popular ride sharing service (I can’t remember which) follows up with customers when they leave bad reviews. This shows users that their opinions matter. And it shows them that the company cares. Now that we’ve got a plan in place for users to trust each other, what can we do to encourage them to start a conversation and to take the first step towards forming a relationship? In this example, Lyft as a company seems more personable. The way that they standardise the experience of something as simple as a fist bump makes it seem so much more authentic. That’s one way to get users to trust a company. But we gotta make them like each other too. Now think about Craigslist. What comes to mind, a healthy environment for business or a slight sense of hesitation fuelled by skepticism? For me, it’s the later. And I know for a fact that this is because users are anonymous. You wanna know what’s really weird though? This is a bias that is harboured by someone living in the part of the world where Craigslist was never a thing. The fact that this kind of bias can spread so far and wide is something that we should consider more seriously. And as I’ve mentioned an anonymous seller doesn’t really make me feel safe. Which is why the newer market places favour real profiles. Full profiles go a long way in building trust on the platform. For the folks on Airbnb who don’t have reviews or previous experience they can convey to hosts, it’s extremely important for those users to convey trust in other ways, like customizing their profile and building a basic identity as a member of the community. Building your profile isn’t a task; it’s an opportunity. And it’s our job to highlight that opportunity for our community. Although Airbnb requires some information from our users to book, we don’t require disclosure. That is, we ask guests to tell us who they are, but it’s up to them to tell us about themselves. We could, of course, enforce this by requiring a certain number of words in the “about me” section of users’ profiles. But that would miss the point entirely. This type of intervention makes the company and the users seem more approachable. It makes it easier for one user to reach out to another. And it also makes the company seem more dependable. A dependable company is often one that will quickly pick up on a lot of loyal advocates. Now that users are open to each other, what’s the next step? To get them to engage with one another of course. In his TED talk, Joe Gebbia talks about how you need to help users build the right amount of trust. If a potential customer starts a basic conversation with “Hey”, acceptance rates go down. The same happens when you share too much information (like letting someone know you have mommy issues). You gotta hit the sweet spot. That would be more along the lines of a compliment and maybe talking about why you’re travelling. The text field: is big enough for a moderate amount of information. Not too much and not too little. Prompts: The prompts guide the users to provide the right kind of information. Not Mandatory: The last thing that they did, is that this information isn’t mandatory. You fill it up if you want to. It’s your way of signalling to potential hosts and guests that you are willing to open up to them and to show that you have nothing to hide. 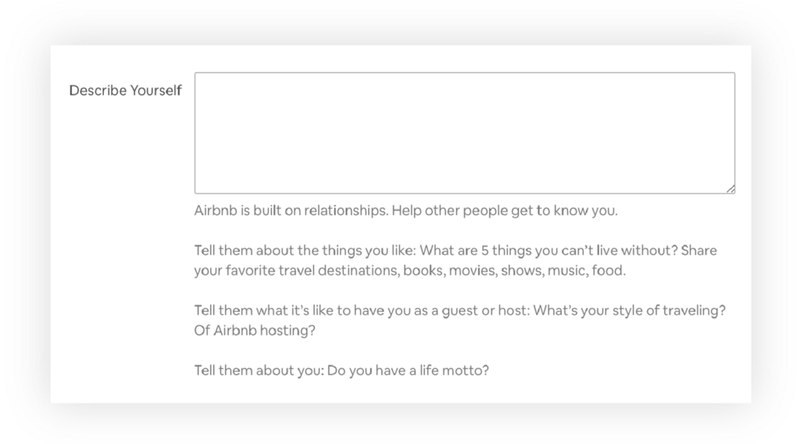 In fact, look at the first line — Airbnb is built on relationships. Would you choose to build a relationship with someone you know nothing about? Or would you rather do it with someone who seems familiar despite how new they are to your life? You know how you always seem to trust someone with your dirty laundry when you know theirs? That’s kinda what I’m talking about here. Products built around the sharing economy don’t just cater to customers, they have a wide range of users. For Airbnb, it’s hosts and guests. For Uber it’s drivers and passengers. You need to look ta all your stake holders. Not just your customers — but all your users. An example of this is Uber and Lyft. 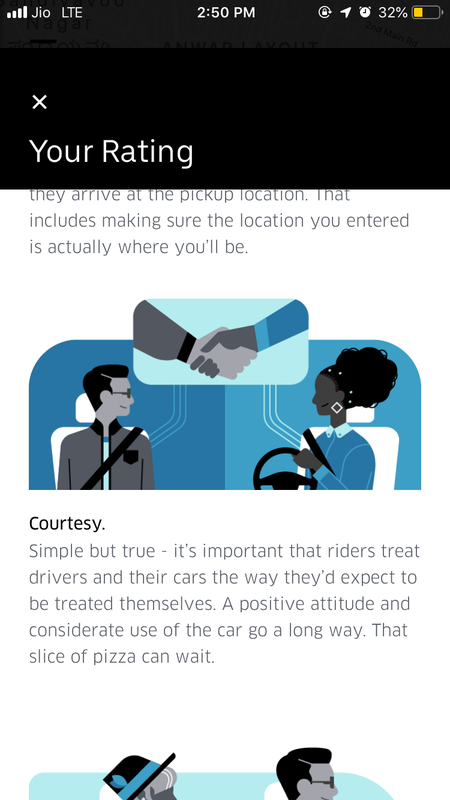 They ask both passengers and drivers to rate their experience. But it doesn’t end there. See, customers don’t want to weed through bad drivers before finding a good one. 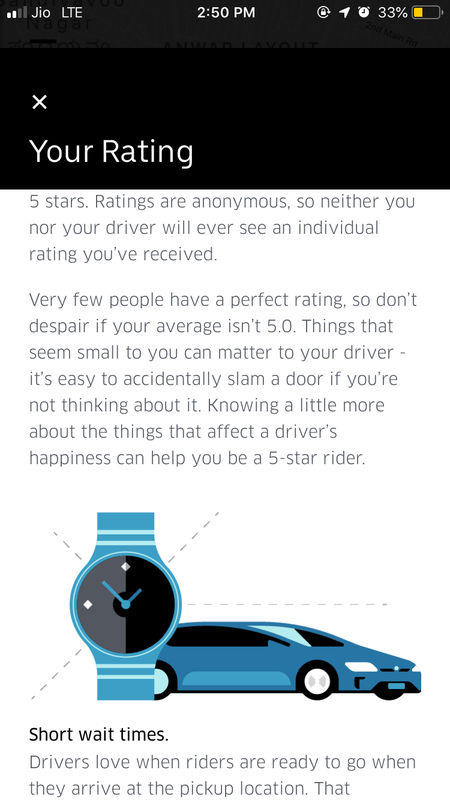 So Uber takes care of that and you won’t ever have to see a driver with a rating lower than say 3 stars. To complement this, apps like Uber give you some helpful tips to be a better rider. And you gotta look at how they phrase this. They talk about mutual respect, safety and courtesy. That’s what does the trick here right? They sound so human, warm and approachable. 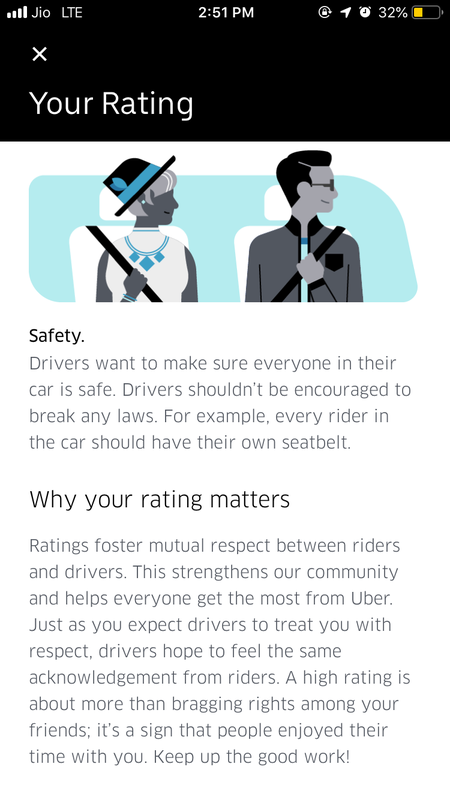 Note how they say “Ratings foster mutual respect between riders and drivers. This strengthens our community” in the last screen. Because in the end, that’s what you’re trying to do — build a community. A community is often a sign of reliability in a way that a large corporate entity isn’t. A community works together for mutual gain. And when it’s guided in all the right ways, a community will weed out most bad eggs while creating an environment that fosters positive growth. The Sharing Economy — Designing for Trust was originally published in UX Planet on Medium, where people are continuing the conversation by highlighting and responding to this story.